The numbers come straight from the horse’s mouth: an MPAA report (PDF) on ticket sales. 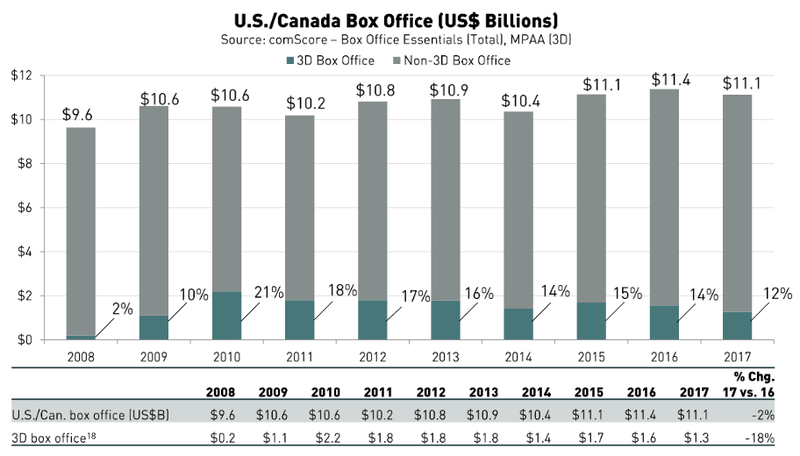 It’s a mixed bag altogether, for the most part positive: people are still watching lots of movies, and they’re paying to go to theaters all over the world. Global box office hit a new record ($40.6 billion) even if the U.S. and Canada dropped 2 percent. You can see that at 12 percent of total box office, it’s the lowest percentage and absolute amount of ticket sales for 3D movies since 2009. The peak, in 2010, was largely due to Avatar, surely the most impressive 3D film and certainly the highest grossing, even if it did use Papyrus for its title font. It’s been largely downhill since then. 3D TVs failed, 3D gaming failed, VR’s special take on 3D is at the very least failing to succeed — so why not 3D film? As an embellishment on moviemaking, it’s largely bankrupt of possibility, but the idea of creating a “premium” tier of moviegoing (the sort-of-stealth motive of 3D) is far from a bad idea. People will pay extra for things like big seats, 21+ showings where you can drink, good food and so on. And as MoviePass has shown, they’ll also pay for theaters as a service — although whether the company can pull that off at the current price point is a matter of some debate. Even if Avatar 2 were to give the 3D box office a shot in the arm, it’s unlikely that the enterprise is considered worth saving when other, fresher opportunities to put butts in seats are in the offing. Here’s hoping 2018 or 2019 will be the last time you have to specify 2D when buying tickets.